Nothing illustrates the cupidity of the politicians and the credulity of the media-men in independent India as the poignant raise of Sonia Gandhi on the political firmament does. 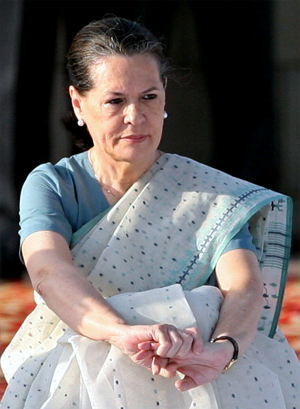 Here is an Italian woman whom destiny made the daughter-in-law of a household that established a dynastic rule in democratic India under the banner of the Congress Party. Of course, for which, by then, her mother-in-law had already castrated the party men into enervation as family eunuchs. And it was the quirk of fate that brought about the untimely death of her brother-in-law, her mother-in-law’s chosen heir apparent to rule the country. While the dynastic compulsions of her M-i-L put the party’s reins in her husband’s hands, the brutal killing of the old despot by her own bodyguards gave her man the reign of the land. And that brought her closer to the seat of political power than ever. As if it is her twisted destiny to get ever closer to power over the dead of her family, tragically, she lost her husband in the midst of an election that was about to undo the Congress. As the sentimental turn around at the hustings put the Congress back into reckoning, her decency as a widow kept her away from the kursi that was hers for taking. But, after all, time is the great healer of grief for the living, and, besides, the dead too wouldn’t be carrying with them the proclivities of their dears. It was thus, in time, the destiny’s ‘child of power’ found the purpose of her life, and wrested the reins of the Congress from that ungrateful Sitaram Kesari who earlier busted his mentor Narasimha Rao. At the hustings thereafter, though she led her party to defeat, yet she staked her claim to be the Indian Premier! It is another matter though, that she was abetted in her bid for power by the penchant of the anti-BJP elements beguiled by the age-old Indian realpolitik of settling native scores with foreign hands. And, in the end, it was the principled opposition from a handful of otherwise self-serving congressmen that put paid to her eagerness to ascend the throne. The next time around, thanks to the anti-incumbency vote in a couple of States, she nearly came to power at the Centre that is, just nearly. Maybe, the public outcry at her impending coronation or the troubled conscience of the country’s President, and/or both, that made her retreat, albeit, in the halo of sacrifice that the morons in the media and the sycophants of her party vied with each other to accord her. Thus, going by her twice aborted attempts at taking on the reins of the nation, it would appear that the Hindu EQ at last scored over the media IQ as well as the Congress SQ, i.e., Sycophancy Quotient. Nevertheless, her twisted ‘destiny of power’ continues to ensure her backseat driving of the democratic omnibus of India. I'm thrilled Subhasji that you are thrilled with my piece.